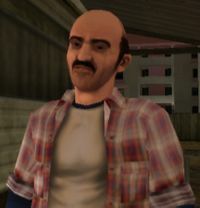 Marty Jay Williams is the head of his own gang in 1984, the setting of Grand Theft Auto: Vice City Stories. Marty's gang dominates a wide range of criminal activities in Vice City's poorer communities, such as loan sharking, prostitution, and protection rackets. Victor Vance works for Marty near the beginning of the game. He is a stereotypical redneck - he has a thick accent, is a drunk, is believed to be inbred, and he verbally and physically abuses his wife, Louise; he is thus the brother-in-law of Phil Cassidy and Mary-Jo Cassidy. Louise eventually attempts to move out, but Marty kidnaps her. Vic tracks him down and kills him before he can get to his hideout. After Marty's death, Vic acquires all of the Trailer Park Mafia's businesses as his own. Marty is voiced by Jim Burke. The missions Vic does for Marty in GTA Vice City Stories resemble the missions Niko does for Vlad in GTA IV: convincing owners of stores to pay protection money. Also note that Vic shows his dislike for Marty just like Niko shows his dislike for Vlad. Both Marty and Vlad are killed by the protagnist early in the game. This page was last modified on 7 August 2012, at 21:54.